A few nights ago I heard lots of kid voices on the gravel road in front of our house which is highly unusual. I mean, we hear our share of frogs croaking, birds singing, and coyotes howling, but there are hardly ever kids on this dead end country road. They came to the door with a flyer and said they were having an upcoming fish fry and pie auction at their church a few days later and were inviting people in the area to come. We set the flyer out so we wouldn’t forget, and yesterday we ventured a mile up the highway to their church called Friendship Church. We’d been there two or three times several years ago when we were trying on churches, so to speak, but it was so long ago that this was a new experience for us. I’ve got to be honest here, the “how are we going to walk into a room where we don’t see anybody familiar” butterflies were making some serious racket in my stomach. It’s kind of unnerving, you know? To walk into a place where everybody already knows everybody else. It does makes it pretty easy to pick out who is new. But, maybe that’s a good thing because we were greeted with lots of smiles and warm welcomes. In fact, one of the ladies even recognized us from the time we were there like 5 years ago. The kitchen was a buzz with meal preparations and after everyone was seated, chit chat filled the room. As weird as it sounds, in a room full of virtual strangers, I was almost transported back to when I was a kid at my grandma’s Iowa farmhouse. When we got together, the adults in our family used to sit at the kitchen table and tell stories that filled the whole house and meals with laughter. Last night I realized that it didn’t really matter if we knew anyone or not, just being there was enough. For the pie auction, Little Bit and the kids took turns carrying the desserts through the sanctuary to show each one to the potential bidders while the auctioneer was busy calling out the dollar amounts. Ok, this is a really, really huge thing! My boy has never even eaten pie! Like ever! So, with money in my back pocket, this momma set out to get him his first ever fruit-filled confection. Well… I lost by $5. After the last of the desserts sold, everyone was gathering their things and getting ready to head home. I was standing near the pulpit when a kind gentleman I’ve never met before approached me and offered his lovely raspberry masterpiece. What?? Me?? My response was “Let me give you some money for it,” which he refused to take. So, there I stood, dessert in hand and a lump in my throat. Then, a sweet gal I don’t even know came up to me with her arms outstretched. I about fell over when I looked down and saw her gift! It was the very pie that Little Bit had wanted so badly. Seriously? Who does that? Who is soooooooo kind that they buy something and hand it over to someone else? Someone they don’t even know? Suddenly as I started to thank her, I felt the lump in my throat make its way to my tear ducts. I would cry over homemade pie any day of the week and there is nothing better than a church bake sale. Amen to that! You should have seen that dessert table!! There was a triple layer Italian cake, 2 double layer strawberry cakes, pecan pie, strawberry pie, brownies, a “better than anything” chocolate cream cheese bar, and more! Just reading that spoiled my breakfast. Now I want pie. You live in a wonderful community, Jessica. I had goosebumps reading this post. Hey, friend. Your goosebumps bring a smile to my face. Sounds like me… I agree, it is a wonderful community. Kindness radiates around most of the people here. What a gift it is to live here. Not sure how I stumbled into such kind people, but am so thankful I did. The pies are absolutely delicious. The raspberry one is kind of like whipped cream and maybe jello? I am not sure, but it is so wonderful. The fruit pie is blackberry. Delicious! Thank you for reading and for your comments. If we were neighbors, I’d run a couple of pieces over! You’re welcome! By the way, how are you feeling? Shingles gone? Medical herbalist? I’ll look into that, thank you. Wow! Glad to here it helped you! Sounds like we have matching tear ducts! 😊😊 Thank you for reading and for your wonderful comments. The pies are soooooo yummy! Got to love homemade. Oh my goodness, I don’t eat pie either, being GF, but I stuck a spoon around the crust and right in the middle of the raspberry one. Mmmm!! So good. Little Bit even tried them! Thank you, it did mean a lot. What a wonderful encounter. There are so many kind people in the world. Thanks for sharing this story. And enjoy every bite of those pies! Hi. Thank you for reading. Love what you said about kind people in the world. These kindnesses snuck up on me- I never expected it. Wish you lived closer, I’d get out the bowls and ice cream for the blackberry pie! Sounds delicious! We don’t have pie very often, but my favorite is apple warmed up with a glob of vanilla ice cream. Those were so very kind people! And I’m glad you got the pie… I love church bake sales! Church bake sales are the best, aren’t they? Love the idea of tried and trusted family recipes being made with love. You would have loved that table full of scrumptious desserts. Yum. They surprised me with their kindness. That’s one amazing thing about kindness, simple gestures can sometimes knock us off our virtual feet. :) Thank you for reading. Hey, how’s your dog? She’s so much better, thanks! And great minds must think alike (so do ours) because I was just thinking of writing a post about how important small acts of kindness are! Oh I am soooooo happy to hear she is better!! Yay! That’s funny about our great minds, we do seem to write similar things sometimes. I hope you do write it, I’m excited to read it! I was getting a lump in my throat reading this. Lil Bit must’ve had a huge smile when he saw you with the pie he wanted badly. Did he like it? We sound like twins! Oh, yes, he was very happy to see that he got it after all. He did like. He tried them both. They are soooooo good. Oh my, yes. I’ve never heard of the raspberry one and it is really good. It’s light and just a bit tangy. 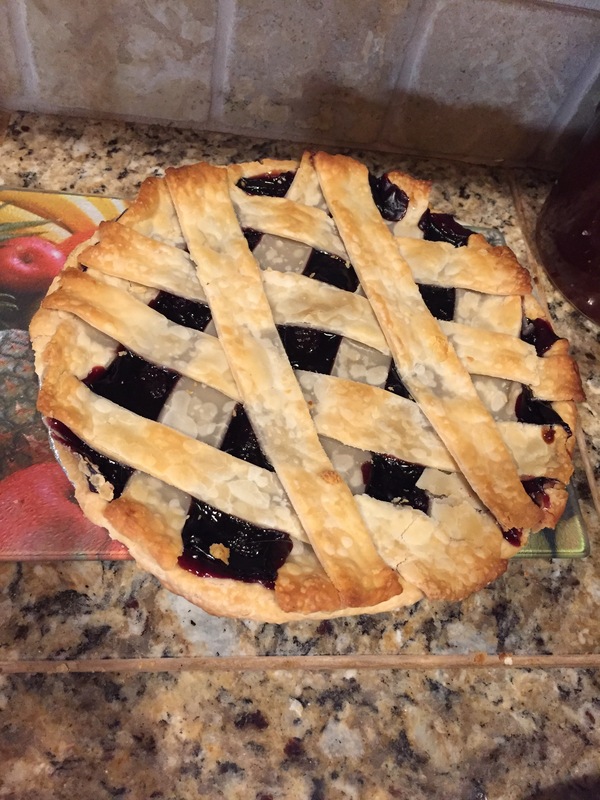 You should see the crust on the blackberry pie. So crisp and flakey. Definitely a treat! There are some people, few and far between at times, worthy of of the gift of time. Time being the one thing we can give that truly expresses our hope for a better world. Hey stranger! How are you doing? Hope you and Vinny are doing well. Thank you for reading. Time is a great thing to share. Love what you said about a better world. Hi. You’re very welcome. I’m so glad you like it. I just stuck my spoon in the raspberry pie. Mmm good! I’ve never heard of it before. It’s really great. 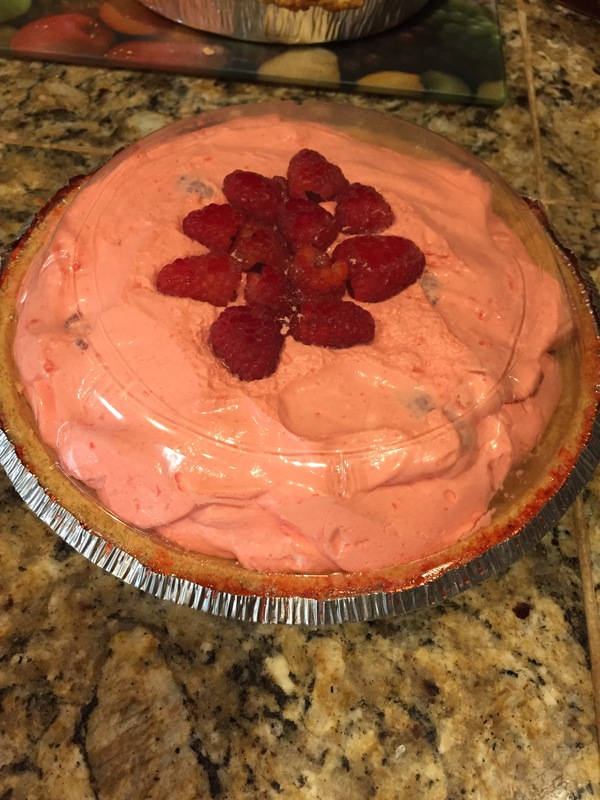 I can’t eat the crust because it’s not GF, but the raspberries are yummy. But, my husband can eat both crusts!!! What a heart-warming story! There are some wonderful people out there. Hey girl, thank you so much! There are some great people around. Can’t believe how nice they were. I’m so good, thanks! How are you? Yay!! Hope you are healing and getting stronger every day. I am pretty good. Trying to get this house ready to sell… Also reading every book I can find- to make sure we are doing everything we can for our Little. I’m sure you did tons of stuff for Dave. ❤️❤️ I can’t even tell you how much I am learning! Very exciting. What a beautiful story, and beautiful gestures from two strangers. Gifts given with hearts filled with love. I’m choked at the kindness, genuiness and the lovliness of two truly beautiful people. It’s like I always say … never lose your ‘ness’. It’s what makes *you* so incredible. Thank you so much for sharing your story with us all. Ha ha. No, we still have some! Want to come over???? I agree about small towns. Kindheartedness is the perfect description. How lucky that we landed there at the church that night. Grateful. We would have some fun, for sure. Ah – what a wonderful story. I would have cried too. Often we forget how many wonderful people there are in this world. The news should tell some of the heart warming stories instead of so much of the awful things in this world. I bet those pies were delicious. Hi. I’m so glad you like it!! Made my day! Thank you!! what a delightful story! You made me cry over [ies too! ha! Isn’t goodness just sweet! YOU are sweet!! I can just picture you reading and getting all choked up! Wish there weren’t so many states between us- we could sit on your porch swing and share these pies. Isn’t that a sweet thought! A little boy with a pie-that is a cute picture! They look super delicious! Love it 😍 Great post! What a wonderful day – and what wonderful people! Hi, how are you? Sorry, I am running behind on responding. They sure were something. I was never expecting such kindnesses. I’m doing well – and no need to apologize – I certainly get behind (/am currently behind) on my blog! It happens to almost all of us. And those who don’t get behind are quite likely robots. Hope you have a great trip! Saw you’re going to a remote spot. :) And, thanks. Good to know that everyone gets behind. I might have cried a little too. Yes, I agree, who cries over a gifted pie, but how wonderful are these guys? And what did Little Bit say? Were the pies tasty? The pies were homemade bliss! The people were beyond kind and Little Bit was sooooooo thrilled when he saw me holding it. He even tried them both when we got home! It was really something to see such kindness in action. Great, well told story. It is wonderful when you can experience the good in people! Your post made me smile! Yayyyyy!!! You made my day just picturing a smile. Thank you so very much. You are very welcome! 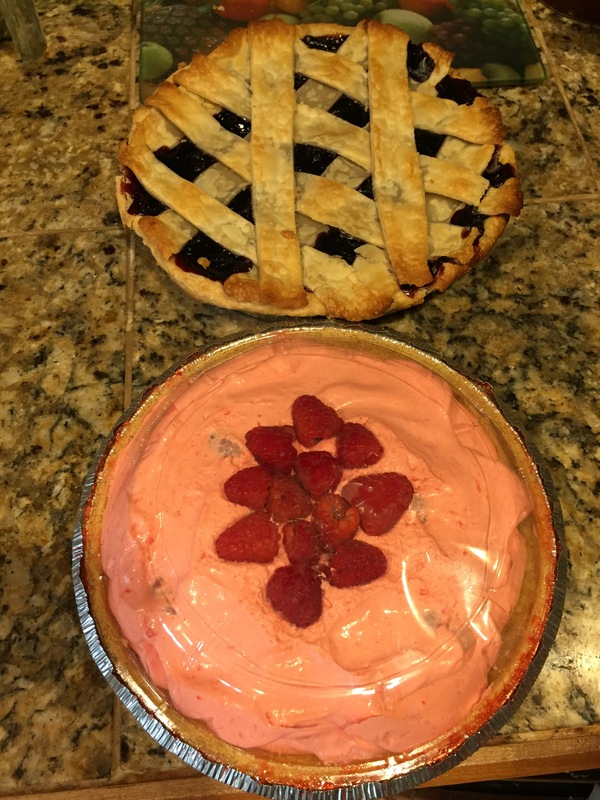 We love pie in our house and will replace a birthday “cake” with a birthday “pie” on many occasions! Ohhh. That is a GREAT idea!! I’ll have to try that! YUM. Thank you. Several Varieties of Apples, three varieties of plums, two varieties of Sour Cherries, one sweet cherry, two types of pear, two apricots (new this year), a peach (new this year), and blueberries (five bushes, several varieties)! We love our fruit! Wow. Those sound amazing. Do you can? We freeze, dehydrate, and can applesauce. The plums I made jam out of and the cherries will freeze. We share a lot with friends. Oh, and we also make cider. Our harvest in 2015 was so large we made 40 gallons of apple cider! Oh my gosh! That is a ton of cider. Bet that was really fun. Hi there! Nice to “see” you here! Yes, yummy is the perfect word. :) They were very tasty!